Together with Matthias Kohler, Michael Budig and their students from ETH Zurich, we held a joint review and discussed the latest research on robotic fabrications in architectural experimentation. 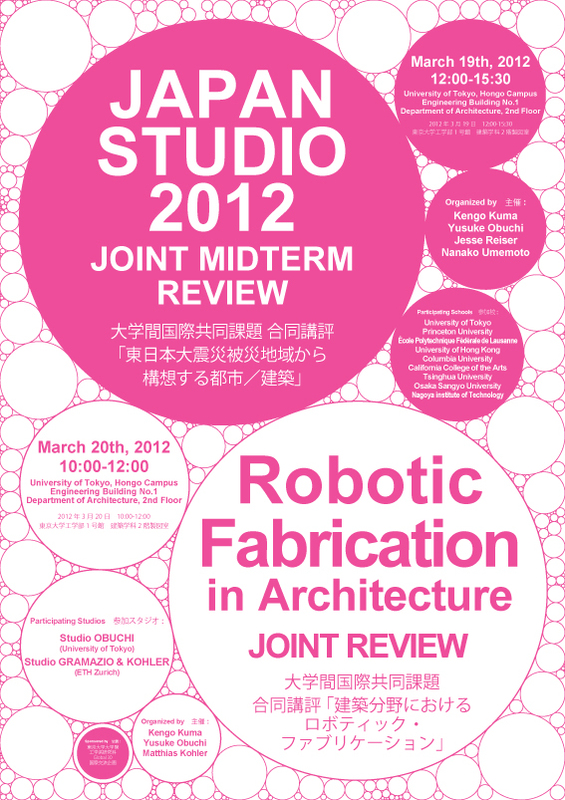 We hosted a midterm review at University of Tokyo joined by 9 schools from US, Europe and Asia. We went to a boat trip to see a face of Tokyo which can only be seen from rivers. The trip was organized by Prof. Jinnai from Hosei University and also joined by Ken Oshima of Washington University and Prof. Mark Mulligan of Harvard GSD. We have seen many places in Tokyo, but from the river, the city looked quite different. Thank you Prof. Jinnai for organizing the trip! We visited the world’s largest Storm Water Discharge Tunnel which prevents flooding disasters. A giant tunnel connects many small rivers with Edo River, Tokyo's major river, helping to reduce a potential overflow into residential areas during major storms. The tunnel was HUGE! It is also know as Underground Temple.